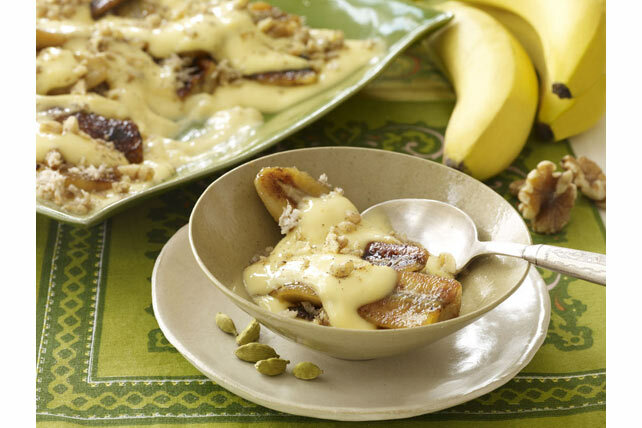 Bird's custard powder makes the perfect sauce for the bananas. Mix custard powder and granulated sugar in medium saucepan. Gradually stir in milk. Bring to full boil on medium heat, stirring constantly. Remove from heat; set aside. Combine coconut, 2 Tbsp. nuts, 1 Tbsp. brown sugar and 1/2 tsp. cardamom in small bowl. Cut bananas lengthwise in half, then cut each piece crosswise in half. Toss with remaining brown sugar. Heat large nonstick skillet sprayed with cooking spray on high heat. Add half the bananas; cook 1 min. on each side. Transfer to plate. Repeat with remaining bananas. Spread 1 cup custard onto bottom of 9-inch square dish; cover with half the bananas. Sprinkle with coconut mixture. Top with layers of remaining bananas and custard. Sprinkle with remaining cardamom and nuts. Refrigerate 1 hour. Prepare using desiccated unsweetened coconut.